So, How Impressed Were You With The WWDC 2013 Keynote? This year’s Worldwide Developers Conference keynote was perhaps the most thrilling event Apple has produced in recent years. While much of the show focused on iOS 7, there was also a lot of attention thrown at OS X as well. In the coming weeks, we’ll be spending a great deal of time discussing each new product and feature in depth. For now, we offer our initial take on some of the things announced in San Francisco, Calif.
For months, we’ve heard that iOS 7 would be a game-changer – or perhaps, more accurately, needed to be for Apple’s sake. In two words, Apple appears to have hit a home run with iOS 7, both in terms of its radical new design, to its new and improved set of features. For the first time, Apple’s software and hardware teams are on the same page. As a result, simplicity and minimalism are in, while Apple’s use of skeuomorphic design is gone for good. 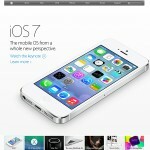 Everything about iOS 7 has been changed this time around – from the home screen icons, to the apps themselves. As Apple notes, “conspicuous ornamentation has been stripped away. Unnecessary bars and buttons have been removed.” Here are just a few of the design changes: The most interesting change coming to iOS is perhaps the use of translucency, which will add layers to the overall user experience. This was definitely a surprise, and I can't wait to see what it looks like in practice. Had Apple simply stopped at design, iOS 7 would have been considered a pretty important release. However, the update also includes a number of new features that as concepts look quite interesting. First among these is the new Control Panel, a new screen where you can turn on and off Airplane mode, Wi-Fi, Bluetooth, and Do Not Disturb. Also from this screen, you can lock your screen’s orientation, adjust the brightness, play music, or connect to AirPlay-enabled devices. These features have long been available to jailbreakers. It's nice to see them finally coming to an official iOS release. Apple has also made a change to the often overlooked Notification Center. Apple has finally given us a reason to go here each day thanks to a new Today feature, which features quick looks at calendar events, the local weather report, and more. The next version of iOS 7 also includes more advanced Multitasking, which is said to learn which apps you use most and updates them in the background accordingly. This feature is also supposed to improve battery life on your device. For the first time, app updates will be performed automatically. This feature, which sounds promising in practice, could cause some problems the next time a third-party developer releases an app with a bug. Luckily, this feature is optional. AirDrop is a feature that comes right out of Android's playbook. With it, users are able to send files securely to those around them who also have iOS 7 installed on a device. These files can include photos, videos, contacts, and more. Unlike Android, no tapping of devices is required. 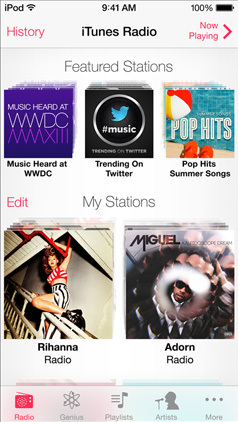 iTunes Radio Finally, there is iTunes Radio, Apple's long rumored streaming music service. Available through the Music app in iOS and iTunes on a PC or Mac, the ad-supported service is free and gives users unlimited streaming through curated or user-created stations. Subscribers to iTunes Match will get the added bonus of receiving the service ad-free. At launch, the service will only be available in the U.S.
For the first time, an OS X release isn't named after a cat. Instead, OS X 10.9 is called Mavericks. 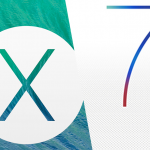 Like previous versions, OS X Mavericks sees the arrival of features long available on iOS. These include iBooks, Maps, and new tagging tools. OS X Mavericks also introduces a feature new to both it and iOS 7: the iCloud Keychain. With the iCloud Keychain, users are able to store their usernames and passwords across multiple devices. Better still, the feature's Password Generator suggests unique and complex passwords so you don't have to. This is all done using AES 256-bit encryption. OS X Mavericks also brings a more simplistic look to the Calendars app. New features here include continuous scrolling, a new event inspector tool, and event mapping. Safari has also received some noticeable new features. Chief among them are improvements to how Top Sites and the Reading List are displayed. Apple is also making it easier to find your social friends directly within the browser. For Mac power users, Apple is introducing new multiple display tools. As a result, there is no longer a primary or secondary display. Instead, each now has its own menu bar, and the Dock is available on whichever screen you're working on. Other new OS X features include Finder Tabs, Notification improvements, and a number of advantaged technologies. Available immediately are two new MacBook Air models. Both the 11-inch and 13-inch models included better battery life, faster storage, and the latest 802.11ac technology. Prices begin at $999 for the 11-inch model, and $1,099 for the 13-inch model. Available later this year is the new Mac Pro, which takes on a completely new design. Just 9.9-inches tall with a diameter of 6.6-inches, the Mac Pro includes better graphics, support for 4K displays, improved memory, Thunderbolt 2 technology, and a lot more. Despite a nice presentation introducing the Mac Pro, Apple didn't actually show the crowd one of the devices. They also didn't announce prices or a firm release date. Apple also announced that the new Mac Pro will be assembled in the United States. After the introductory video, the folks at Anki introduced new artificial intelligence cars that work through a new app, AnkiDrive. Despite the product's promising look, I found its inclusion at the event a little bit weird. This was especially true given that it turned out to be the only third-party app presentation of the entire keynote. The Moscone Center was a great place to be on Monday morning. However, as time on the keynote ticked by, the presenters started to rush. In particular, the iTunes Radio announcement went by so quickly, it didn't sound as extraordinary as it probably should have. No new MacBook Pro models? There was absolutely zero love shown to the iPad or iPad mini during the iOS 7 presentation. As such, Apple made it clear where it makes most of its money: the iPhone. Again, we're just scratching the surface on the new products and services announced during the keynote. Come back often in the coming days and weeks for more reports. Did the keynote live up to your expectations? What products are you most excited to hear more about?